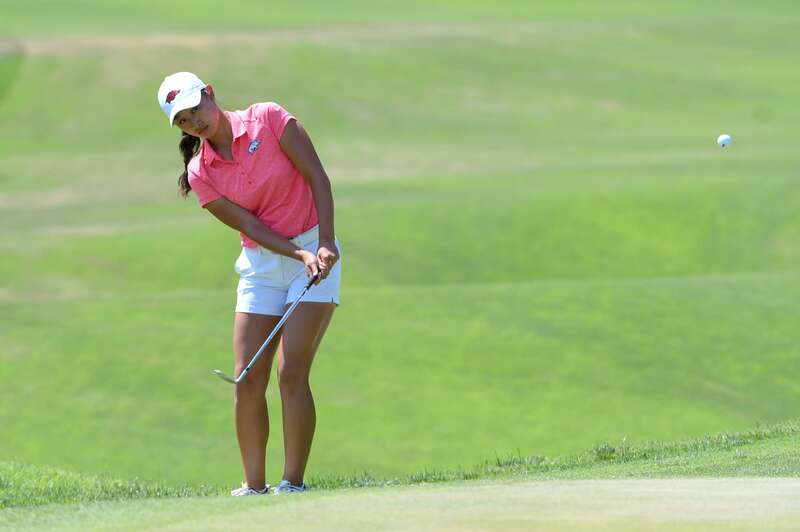 RIO GRANDE, Puerto Rico – Second round scores of 73 moved University of Arkansas seniors Maria Fassi and Kaylee Benton into a tie for fourth place with teammate Dylan Kim at the Lady Puerto Rico Classic in Rio Grande, Puerto Rico, on Monday. Kim, Fassi and Benton are tied at 144 helping the seventh-ranked Razorbacks hold on to second place with one round remaining on the River Course at Rio Mar Country Club. Kim opened play in round one shooting a 3-under 69 but found just one birdie on the course Monday. She turned 1-over and picked up two more bogeys to finish plus-3 for the day. Fassi and Benton had three birdies and four bogeys each but both players moved up two spots from round one. Although temperatures were in the mid to high 70’s rain and windy conditions challenged players in the first event of the spring season. The wind and rain are expected to continue through Tuesday’s final round. We got out to a bit of a slow start today and really didn’t recover from that. We have a couple of players in contention to win the tournament and so is our team and that is a good thing. We will go out tomorrow and execute our game plan. We want to take advantage of the opportunities that we get, and we are really looking forward to tomorrow. Arkansas returns home for qualifying before the second spring event at the Darius Rucker Intercollegiate March 8-10. The event takes place at Long Cove Club in Hilton Head Island, S.C. The Razorbacks and Blessings Golf Club host the 2019 Women’s and Men’s NCAA Championships in May. Check out NCAAGolf19.com for more information and volunteer opportunities.